A wonderful fog greeted me this morning and I couldn’t resist painting it. I grabbed a cup of coffee and my paintbox, and headed out the door. By the time I arrived at this location the first blush of sunlight warmed the sky with a peach glow. The thick fog muffled the usual morning sounds and created a peaceful stillness in the air. It was magic. For the benefit of other artists following my blog I shot a few photos of the painting as it developed. In step (1) the scene was sketched with thinned paint to establish the large shapes of the composition. 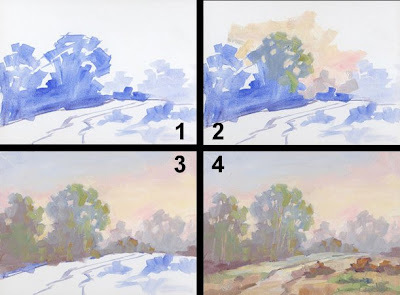 Next I captured key color notes that might change soon (2), followed by the creamy blend of soft colors across the sky and distant trees (3). Finally (4) I worked my way forward to complete the painting. It was the perfect way to start the day. There has been a great deal of interest in my “PAINTING BIG” PACKAGE (see yesterday’s blog), and I wanted to remind everyone that my “PLEIN AIR QUICK-START PACKAGE” is also still available. If you would like to try your hand at plein air painting but can’t attend my live workshops, my new PLEIN AIR QUICK-START PACKAGE will get you started on the right path. It also makes a unique Holiday gift for your artist friends! 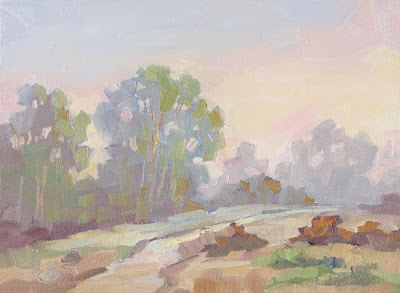 The FREE QUICK-START GUIDE includes tips on a plein air kit I created that’s virtually free and goes anywhere, PLUS my personal secrets to help you create plein air “winners” every time. The TWO FULL-LENGTH VIDEOS are from my TV shows, filmed live on location. Each video covers a different subject and shows me filmed in real time as I go from blank panel to finished painting. It’s like being there with me. The SPECIAL BONUS BOOKLET contains more than 40 full color reproductions of plein air paintings from a major solo exhibition. The entire PLEIN AIR QUICK-START PACKAGE is just $50, and shipping is free anywhere in the USA. To order, email me at: tombrownstudio@cox.net. Lovely painting, as usual, and thanks for the tutorial. It is always interesting to see someones "start"